Herbicide injury from glyphosate: a non-selective, systemic herbicide. Initially, new tissue chlorosis on most grasses and broadleaves. 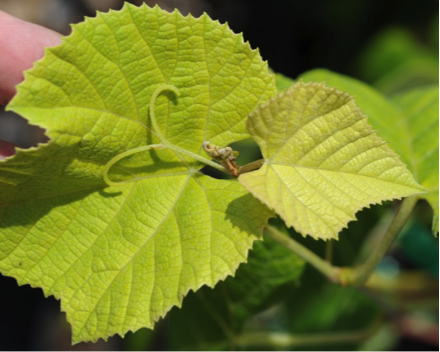 Chlorosis progresses to tip necrosis in 5 to 10 days. Necrosis of entire plant within 3 weeks. Woody plants or glyphosate resistant weeds may re-sprout. Re-sprouting tissue may be chlorotic, malformed, strap-shaped, witches broomed. In woody perennial weeds, symptoms may re-occur up to 3 years after exposure. 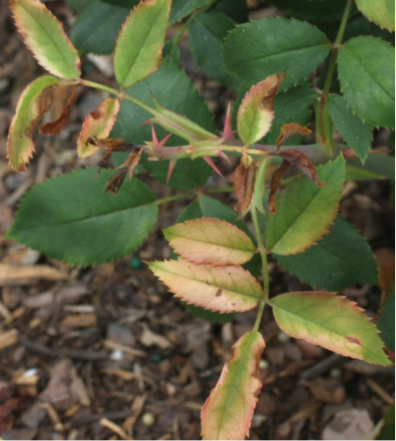 Fall applied glyphosate on knockout rose causes variable symptoms the following spring. 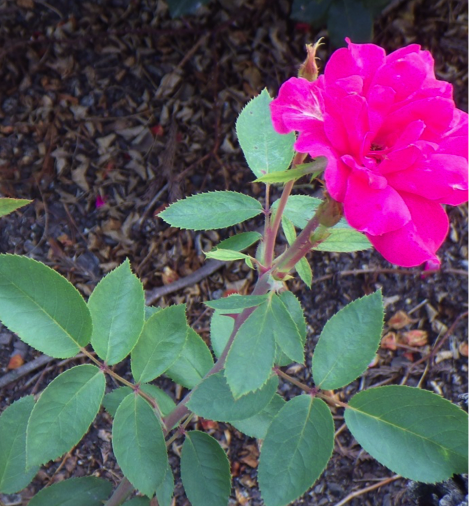 Knockout rose, non-treated new growth on the left; treated on the right. Two weeks after treatment. Glyphosate spray drift injury on rose, 2 weeks after treatment. 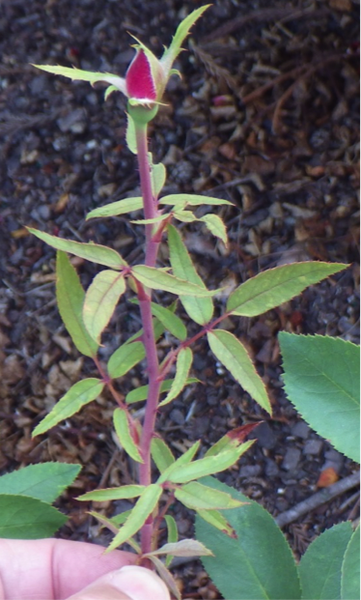 Non-treated rose. Photo taken same day as preceding photo. Glyphosate misapplication to rose. About 3 weeks after treatment. Tip necrosis. Glyphosate spray drift, systemic injury to tomato, 5 days after treatment. General chlorosis on new growth of grape, 5 days after glyphosate spray drift. 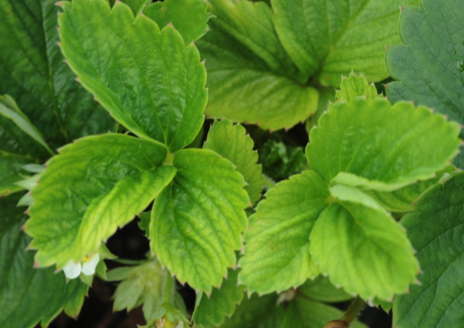 Strawberry new growth is yellowed from glyphosate spray drift, 21 days after treatment. Glyphosate resistant horseweed resprouts after glyphosate treatment damages the growing point. Foliar applied and symplastically translocated throughout the plant. Root absorption is rarely possible, only in sand or other soilless substrates. Not volatile. Crop injury is most likely as a result of misapplication or spray drift. 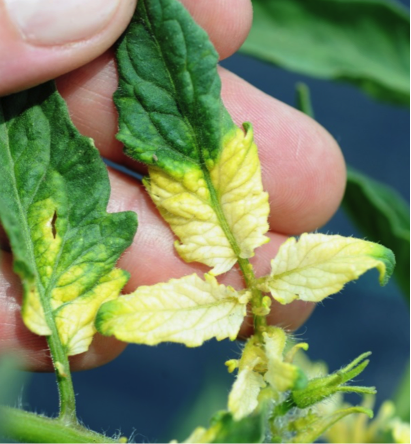 Frost damage – non-selective injury to plant tops. Paraquat (gramoxone) – rapid burn-down of all above ground tissue; regrowth possible. ALS inhibitor herbicides may produce nearly identical chlorosis and tip die-back. 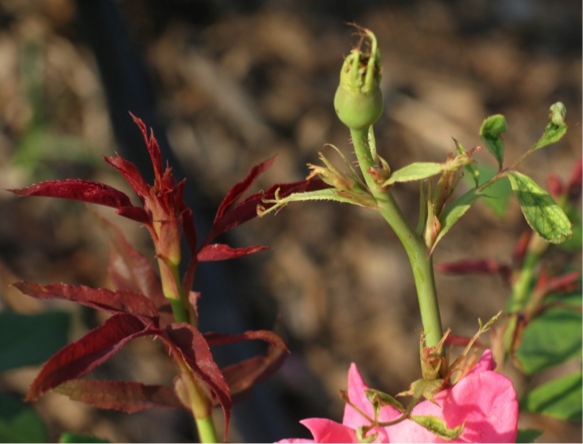 In woody plants, strap-shaped distorted foliage may resemble auxin herbicide damage, ALS inhibitor herbicides, or plant virus (such as rose rosette virus).